This was the first article I ever submitted and it has a story all of its own. Whilst living in Uganda I took a break and flew down to Namibia, in southwest Africa. One of the highlights of my trip was a multi-day hike through the beautiful Fish River Canyon. When I returned to the UK I thought a write-up of my adventure might be of interest to a walking magazine. 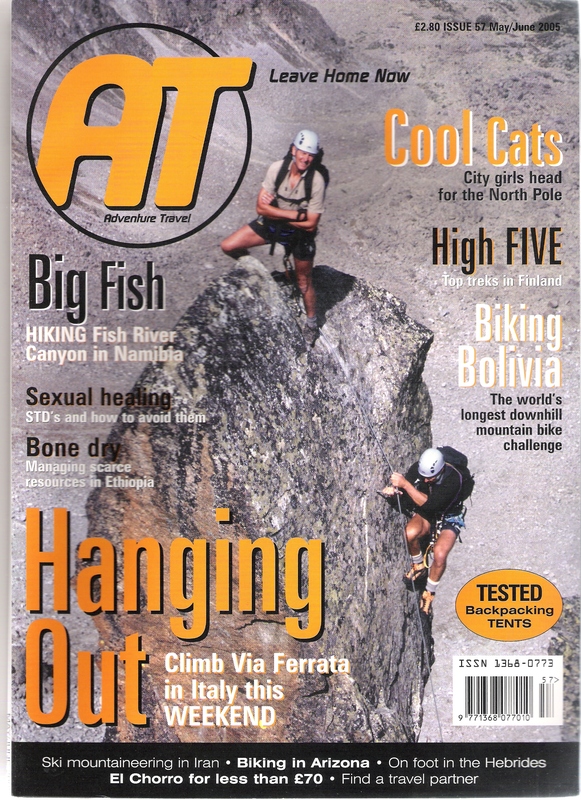 Following a bit of research I discovered Adventure Travel magazine, a monthly publication that featured adventurous multi-day hikes. And, even better, they produced submission guidelines for would-be contributors spelling out exactly what their requirements were. Full of excitement I wrote the article and posted it off via recorded delivery as I also sent a number of transparencies to accompany the words. Because I had sent the package via recorded delivery I could track its journey on the Post Office website. Unfortunately, even after a few weeks, it didn’t show up as having been delivered. Gutted that I had lost my transparencies (the originals) I made a claim to the Post Office for my lost package and duly received £10 compensation. Imagine my surprise when seven months later (and three days before my wedding) I suddenly received an e-mail from Adventure Travel saying they were intending to publish my article the following month and checking the return address for the transparencies. Not only had the package not been lost but I had achieved publication with my very first submission. Why was the submission successful? Two reasons: luck and meeting the submission requirements. Luck because it was the right subject at the right time – they hadn’t already featured that hike. I can’t stress how important it is to give editors exactly what they ask for. In this case the guidelines asked for an article of X words, a Let’s Go section of X words outlining how someone else could do the hike, a hand-drawn map of the route and a number of photographs. They also suggested the style of article. Apart from changing the title to Big Fish (I preferred my original title, Baboons at 12 O’clock) and a few words here and there the article was printed largely as I wrote it. The path to publication for this article was somewhat different. I had moved to New Zealand and was looking for markets for travel articles. I found Latitude, a lifestyle magazine covering the Canterbury region, which featured a travel article in each issue. Although perusal of a few issues showed that the same person contributed most of the travel pieces I thought it worth a shot. I e-mailed the editor and asked if they accepted freelance contributions and, crucially, I attached a piece I had written about a trip to the Arctic. The editor wrote back saying their travel section was covered but she liked my writing and asked if I could write a feature on a local event. Too right I could. I had me a commission! The event was an annual multi-disciplinary (running, rafting, cycling) team competition for women only, which that year was due to be held in Canterbury for the first time. The brief from the editor was an article of 1200 words covering the history of the event and interviews with the organiser and some of the previous participants. Aargh! I had never interviewed anyone before so this presented a challenge. Fortunately, a quick internet search provided me with the organiser’s name and contact details. I e-mailed him and he was more than happy to talk about the event. He wasn’t local so it would have to be by phone. Nervous does not describe my feelings. However, I did my homework, typed up a series of questions and called him up. It couldn’t have gone better. He was charming and helpful and gave me some great quotes. He also gave me the contact details of one of the previous event’s winners. She was local so I was able to meet her in person. And it snowballed from there. Having interviewed the professionals I needed to speak with two ‘ordinary’ participants to provide a balance and the winner gave me two names – a first-timer and the oldest entrant (67). I ended up conducting two telephone and two face-to-face interviews and it was nowhere near as scary as I first thought. People love to talk about things they are enthusiastic about. I just prompted them and off they went. Integrating the juicy quotes into the article and keeping it to 1200 words was surprisingly easy and off it went with a series of digital photographs provided by the organiser. Simple – I met the brief. The article was published exactly as I wrote it with no changes, not even to the title. When the editor says, “I love what you have done with this piece . . . I think you have done a wonderful job”, you know you have nailed it. There is more than one route to a successful article. In my next post I’ll discuss pitching – another way to get a commission. Links to the articles featured above, Big Fish and Challenging Times for Women in Canterbury, can be found on this webpage. If, like me, you are having trouble getting your fiction published it may be time to try something different. Receiving rejection after rejection can be demoralising. I suggested some ways to react to rejection in my first blog post, 7 Ways for Writers to Overcome Rejection, but one I didn’t mention was changing tack for a while. Don’t give up on your fiction hopes – Ruth Rendell wrote 7 books before getting published – but take a break and try something different. In this post I outline why turning to non-fiction article writing could boost your confidence and how you should go about it. Achieving publication boosts your confidence and self-esteem. After your first by-line appears you can say, ‘I’m a published writer.’ Believe me, it feels good. Thousands of magazines are published in the UK. Go into any newsagent and survey the shelves. They go on forever. And on top of that there are many hundreds of e-zines. There is a huge market out there just waiting for your submissions. Write about what you know is no longer valid advice for writing fiction but it is a good maxim for getting started in magazine writing. What are your hobbies? Are you a keen cyclist, runner, horse rider or pigeon fancier? You probably already read a magazine that focuses on your hobby. If not, scan the newsagents’ shelves and find one or, better still, find two or three. Take each of the magazines that cover your area of interest and deconstruct them. Stop. I don’t mean tear them apart! Read through them and take notes. How many sections are there? How many articles in each section? How long are the articles? Half a page, one page, two pages? Do they have photographs? Did the writer supply the photographs? What type of articles are they? Who wrote the articles? When you have finished that exercise go to the Editorial page and find the list of editors and sub-editors. Check their names against the list of article writers. This will give you an idea of how many articles in each issue are staff-written and how many are written by freelancers. Now work out how many opportunities each magazine offers to freelancers. If a monthly has five slots per issue for freelancers that is 60 opportunities in a year; if a bi-monthly has 12 slots that is 72 opportunities. Logic suggests choosing the bi-monthly but that may not be the best choice. Does it have a more exclusive feel? Are the features longer and do they appear to have ‘professional’ photographs? If so, it may not be the best place for a beginner to pitch to. Where do I get ideas for articles? First, check if your selected magazine has a website. If it does, search it for contribution guidelines. They are rare for British magazines but some do have them. If guidelines exist they may say which sections are open to freelancers, the word count required, whether photographs are required and even topics to cover. If there are no guidelines refer back to your notes on the selected magazine. Of the articles that appear to be provided by freelancers are they first-person accounts, how-to articles or interview pieces? How long are they? Have you run a race somewhere unusual? The Arctic, maybe! Do you have an unusual training regime? Could you interview the organiser of your local marathon/10Km race? Let’s say you’ve run the Svalbard Marathon (it’s in the Norwegian Arctic) so pick that as the subject for your article. How do I write it up? Find a similar first-person account in a previous issue of the magazine and deconstruct it. Does it start with an anecdote or a quote? They often do. Find something unusual that happened during the race (maybe a polar bear wandered across the course) and use that for your opening. How does the middle of the narrative continue? Is it a straightforward account of the race or doe it dip into the history of the event and mention famous winners or unusual happenings? Follow the same pattern in your piece. Finally, finish it off by referring again to the incident you mentioned in the first paragraph. Edit and proof-read until it is perfect and send it in, usually by e-mail, with a covering message. Now forget it and think of a new idea for the same or another magazine. In my next post I’ll give two case studies from my own experience. One, for Adventure Travel magazine, was the first article I ever submitted, and is a straightforward first person account of a multi-day hike; the second, for Latitude magazine, was my first interview piece.